PORTLAND – The middle portion of New Orleans’ longest road trip of 2018-19 has brought frequent reminders of what the Pelicans accomplished last spring, including visits to both playoff opponents (Golden State and Portland), as well as the venue where they clinched a 2018 Western Conference postseason berth (Los Angeles’ Staples Center). During Wednesday’s action-packed 147-140 defeat vs. the Warriors at Oracle Arena, another major piece of the ’18 run emerged, as Nikola Mirotic kept firing in long-range bombs, making his biggest impact since he opened this regular season with 30- and 36-point performances against Houston and Sacramento. It was reminiscent of April, when the 6-foot-10, 250-pounder helped the Pelicans reel off nine straight wins, sealing a playoff trip, then sweeping the Trail Blazers in Round 1. Over that stretch, Mirotic averaged 22.4 points, highlighted by a 30-point outburst in Game 3 vs. Portland, featuring 12/15 shooting from the field. 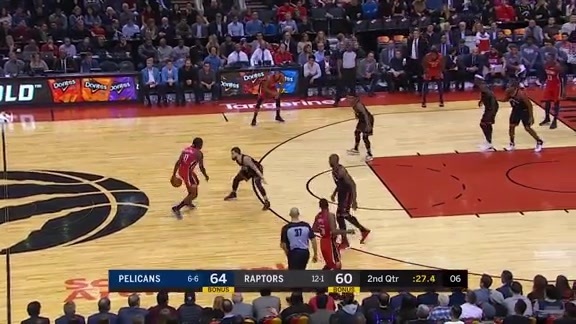 Two days after his only scoreless game since joining the Pelicans, Mirotic erupted against the Warriors by connecting from long distance, going 6/10 on three-pointers. His six treys matched a season high, the first time he made five-plus trifectas since Nov. 26. Of course, he also recently missed the equivalent of a month of action, sidelined for 12 consecutive games due to an ankle injury. New Orleans scored its second-most points of ’18-19, trailing only a 149-point night vs. Sacramento on Oct. 19, during which Mirotic not coincidentally delivered a career-high 36 points and went 6/8 from the arc. “I thought he played well tonight, and he needed one of those games,” Pelicans fourth-year head coach Alvin Gentry said. As New Orleans (21-24) tries to replicate its late-season, 20-8 surge from a year ago, Mirotic may be the team’s biggest X-factor, the Pelicans’ most feared three-point threat and a valuable rebounder and defender. After going 0/3 from the field in 17 minutes against the Clippers on Monday, Mirotic was pleased to make a major contribution while facing the Warriors, who needed to rally from a 17-point deficit to overtake the Pelicans. Despite a loss that dropped New Orleans to 3.5 games out of eighth in the West, the Pelicans were mostly positive about what transpired in Oracle Arena, partly due to Mirotic’s breakout night, as well as encouraging indicators in ball movement (36 assists, tied New Orleans’ season high) and perimeter shooting (19 three-pointers, tying franchise record).